For some, the 2012-13 Benfica campaign was something special to behold. The team’s progress in various competitions was incredible considering certain factors, not least of which was the departure of two of the side’s key midfielders in Javi Garcia and Axel Witsel. Yes, all the trophies eventually escaped Benfica’s clutches, but to reach two of three possible finals and lose the league by one point is hardly the sign of a bad team. Football, however, like most things, takes on a very different spin in certain context. After winning the league in his first season as manager, Jorge Jesus has flattered to deceive as Benfiquistas have become painfully accustomed to being envious onlookers as Porto celebrate a third title in a row. Admittedly, the last one was only lost by one point – a far cry from the 21 point gap in 2010-11 – but that’s little comfort. The nature of the loss of the title in such dramatic circumstances didn’t exactly help boost the morale of a group of players either, many of whom have performed exceptionally well. All the psychologists, interested onlookers and nauseatingly optimistic fans will no doubt emphasise, philosophically, that the team will be stronger for all these challenges that were faced. Some were conquered, and some brought tears. Either way, whatever side of the fence you sit on in how you assess Benfica’s season, a few things are clear. 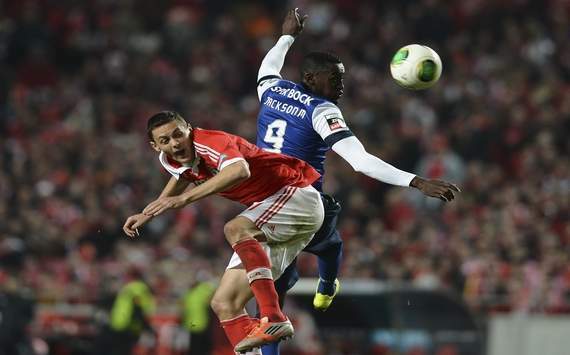 As much as the margins for error were unkind to Benfica, there is room for improvement. Lessons can be learned – and it’s evident some lessons have needed learning for more than one season.Some existing strategies are excellent and should be maintained – but Benfiquistas will hope that the obvious weaknesses in the team get some proper attention before next season kicks off. So while it may be considerably early to already start talking about next season, Benfica have some time to analyze and understand their mistakes from this campaign. Here’s my wishlist of items that I hope, come August, the Eagles will have addressed in some form or another. Look at all the teams in recent years who’ve sustained extended periods of success, and a few common threads emerge. One of the most common is the notion of mentality. Respecting an opponent regardless of their quality. Hunger to win that overrides all other possible emotions, especially the fear of losing. It’s a cliché, but the size in the fight of the dog really matters sometimes, because it’s the ingredient that gets certain teams to perform beyond the limitations of their squad or their own apprehension. Mentally, Benfica are capable of being incredibly composed one game and impossibly paranoid the next. As an example, against Fenerbache in the second leg of the Europa League semi-final, the team’s mental approach was undeniably superb and they rightly got the plaudits for it. But after Benfica’s draw with Estoril put the league in the reach of Porto, the team looked incredibly nervous, and each subsequent game against Chelsea, Moreirense, and finally Guimarães, Benfica almost looked like they expected something to go wrong. I for one believe that when the paranoia of such results is the dominant mental state facing the team, the team’s focus is already lost on the objective. Porto never play Benfica with the fear of losing – they play with the hunger to catch their record. Hunger is what characterizes those dangerous, energetic and difficult teams in Europe. In the Champions League final, Bayern Munich were far and away the superior side on paper against Borussia Dortmund, but the men in yellow and black played with no fear, and were carried by the hunger to win, hence their impressive showing. Benfica need to learn to play the same way. And they also need to learn that disrespecting opponents will also not go far. I agree completely with the sentiment raised in the excellent recent “Talking to The Doll” Benfica podcast, where it was suggested that Benfica didn’t approach the Estoril and Taça de Portugal final with the right levels of respect. After the victory over Maritimo in the league, Benfica celebrated prematurely over possible Liga success – and the suggestion is that they didn’t take their next Liga fixture as seriously as they should have. In the second half of the Taça de Portugal final against Guimarães, complacency was clearly evident. 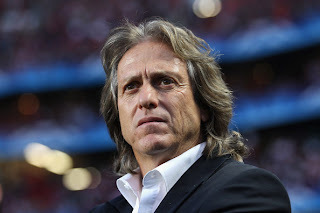 Jorge Jesus’ argument that the team was trying to defend their one goal lead was by no means a convincing explanation to the Eagles’ poor levels of concentration that ultimately led to their defeat. After the title winning side of 2009-10 was significantly diminished through the departures of Ramires, Di Maria, Luiz and Ceontrão in subsequent years, the team has been able to recover well in constantly developing reasonably strong sides, while leveraging savvy scouting that has identified solid talent like Gaitàn, Garay, Matic (granted, he was part of a swap deal, but Benfica still needed to be happy with what they were getting) and Pèrez. The club’s loan strategy has also been interesting, often allowing fringe, but talented players to play elsewhere to keep up match fitness and skill development (especially the youngsters). But the squad’s composition and use is a major issue that affects their success (or lack thereof). The squad isn’t correctly configured for the tactics favoured by Jorge Jesus, and ironically, some deficiencies from 2011-12 weren’t addressed last season. In transfer terms, Benfica already look set to focus too much on attacking acquisitions for next season, instead of taking special care with the defence. One hopes Benfica can learn from their mistakes and optimize their squad better, especially as their main rivals have already lost two hugely critical players – Moutinho and Rodriguez – to Monaco in the summer. In my last article, I explained how Benfica’s tactical approach changed with the adjustments made in midfield due to the use of Enzo Pérez in a more central midfield role (as opposed to a central attacking midfield role) created more emphasis for the fullbacks Maxi and Melgarejo to push up to offer width in attack. Benfica fans will recall in the 2011-12 season having major concerns with the mobility and pace of former left back Emerson, who was largely blamed as the exploited weak link in some big matches that season. It stands to reason that while Melgarejo has played well under the circumstances, some of his performances this season have been very indicative of the makeshift left back that he is. Benfica’s expectations don’t exactly give much room for a situation like that. At right back, Maxi Pereira started displaying uncharacteristic displays of poor decision making and deficiencies in pace, something which Porto eventually leveraged for the crucial winner in the penultimate Liga game of the season. Benfica are too big a club to afford complacency in players “that pick themselves”. Almeida may already offer a viable solution to creating more competition for Maxi at RB, or becoming first choice LB (although the latter isn’t preferable due to him being right footed). The risks of Benfica’s high defensive line combined with their preferred attacking approach means that central defenders, in particular, need to be able to recover ground quickly should opponents catch them on the counter attack. With Garay largely expected to leave, and Luisão lacking pace, it’s clear that a major shakeup may be required in the core of Benfica’s backline. Benfica have been linked with the Serbian Mitrovic, who certainly doesn’t seem to lack the height and muscle, but the issue is pace, and hopefully that’s something that’s prioritized. Luisão isn’t going to get faster, making him a more vulnerable spot to exploit with each game that passes. The easier and weaker teams in the Liga aren’t likely to break through the Benfica backline, and last season illustrated that. But the more tactically savvy, adventurous “smaller” teams and the bigger teams (especially in the Champions League) will know only too well that it’s an obvious weakness to exploit. Gaitan and Aimar are largely expected to leave as well – and Benfica seem to have found replacements, albeit very young ones in Serbians Filip Djuricic and Lazar Markovic, but neither player will produce the performances of the players they are replacing, so Benfica ideally need to recruit some experience, especially in Aimar’s position. Another key issue is the management of fatigue. Jesus would do well to bring in cover for Matic and Pèrez, and actually use it consistently. Creating a situation of over-reliance on two key players and lacking options on the bench that are match fit, or match ready isn’t a good plan, and it also makes your team predictable after a while. So assuming that the departures of Garay and Gaitàn are concrete, Benfica certainly have much to do in the transfer market to strengthen the team. That’s why a few more player sales wouldn’t go amiss in financing transfers in the positions of left back, centre back, attacking midfield and cover for right back, defensive midfield and central midfield. For most games in the Liga, Jorge Jesus didn’t change much by way of his side’s tactical formation, shape and strategy. For someone who has favoured 4-1-3-2 for some time, Jesus found ways to create meaningful variance to the tactical shape this season, particularly by using Gaitàn in the hole behind the striker, or applying the mobility of Lima vs. the muscle of Cardozo in the final 3rd. Benfica’s tactical shape prioritises penetration and attacking flair above all else, which is understandably required in the Liga, where most teams that play the Eagles are going to sit deep and wait for counter attack opportunities. Under Jesus, however, Benfica have displayed some obvious tactical vulnerabilities, which, assuming the transfer suggestions above are NOT followed, will need to be addressed in alternative ways. The first and most obvious one is the tendency to suddenly make surprising team selections or tactical formations in big matches. Sometimes the gambles can work, but Jesus’ Benfica do not have a particularly good record in those big matches. A recent example is the Europa League, where the use of Rodrigo in the hole behind Cardozo was an unexpected and brave tactical move, which worked well in the first half until Chelsea played far more narrow in the second half, nullifying the Spaniard’s effectiveness. Starting with Lima may have been more effective at refining those numerous missed opportunities at goal throughout the game. We’re a far cry from the days Carlos Martins was used as a right wing, so things have improved, but the criticism here is simply that Jesus tends to try these (untested) adjustments in matches where the stakes are high – and the room for error small enough to mean the difference between success and failure. Benfica also needs to recruit defensive options correctly if they’re going to persist with a high defensive line, especially against good sides capable of using this weakness. None of the current Benfica centre backs give a sense of being particularly quick – and Matic’s skills often get demanded up the pitch in attack, leaving the last two defenders exposed to a counter. Either Benfica prioritise speed ahead of height (which they don’t seem to have done with Mitrovic) in a central defender or defensive midfielder, otherwise Jesus needs to start using his taller centre backs properly. As an example, defending with a deep lying defensive line but a high pressing attacking line would typically encourage the long ball aerial ball for a tall Benfica defence to win and control in the midfield. Benfica also would do well to prioritise the recruitment of a proper attacking midfielder in the centre to become the “metronome” through which space can be created by pulling centre backs out of position in their box, something Aimar was exceptional at in his day. Benfica’s strength on the flanks is obvious, but it makes them a very predictable team at times and often one gets the impression Jesus is relying on the extensive skills of players like Salvio, Gaitàn and Ola John to create penetration in attack rather than relying on tactical variations. Jorge Jesus and his side also both need to learn how to defend a lead against big sides. Against Porto and Guimarães, the strategy of “keeping the result” was allegedly attempted – and ultimately failed. Notwithstanding bad luck, Benfica would do well to learn from other sides some very basic ideas in defending such leads. For example – use two lines of four, the deepest line staying around the edge of the 18 yard area to deal with high balls and crosses into the box. The other line sits slightly in front, picking up long range shots, through balls and runs into the box. When the ball is won – keep it. Don’t resort to pointless counter attacks. Players who hold up the ball well and retain, or cycle the ball well are critical to such strategies. There’s nothing more frustrating than chasing a side towards the end of the game, when you’re desperate for the ball to recover a goal to get back in the game. Benfica’s approach instead makes it quite easy for opponents, committing too much in attack and paying very little attention to retaining the ball. It’s not attractive football – but something tells me Benfiquistas won’t care too much if the results are earned because of it. If they can’t do such things – they shouldn’t be trying to defend leads in the manner that they currently do, because it clearly doesn’t work. If there is one element Benfica could certainly improve dramatically, it is their strategic approach to a league campaign, which almost worked this season, save for the team’s possible complacency in ensuring 3 points against Estoril. Benfica shouldn’t have created the situation where they relied on the result in the Dragão to dictate their league campaign – because it’s clear the team wasn’t convinced that they could beat their rivals. While the 2010-11 was a campaign where Porto’s squad and coach clearly showed tactical superiority, the last two seasons’ failures can be argued more by Benfica’s inability to win key games and manage their campaign combined with Porto’s opportunistic manner of “smelling blood” and taking advantage at just the right time. It stands to reason – at the beginning of this campaign, surely the penultimate fixture of the season away to Porto stood out as a possible title decider? Yet, going into that game, Benfica would have had 28 games – including one at home to Porto – where an unassailable lead could have been developed. If Porto wasn’t going to be beaten at their ground, then the game against Estoril especially is where Benfica had to plan ahead and know that victory was essential. Benfica shouldn’t have allowed this game to become a title decider, and they had 28 games before it to ensure that was not the case. Irony and history now combine to illustrate that a possibly unassailable 4 point lead could have been taken into the Dragão – but after Estoril preyed on Benfica’s tactical frailties, Porto took full advantage of the timid approach shown by the Eagles. That’s not to say that it’s acceptable the Benfica aren’t capable of getting a result at the Dragão – but Benfica, despite having an arguably better squad for two seasons, don’t seem to believe – or know – how they can beat Porto. To win the Liga, it’s become quite a simple formula then – Benfica have to probably win 28 games, or figure out how to get results against Porto. With Rodriguez and Moutinho leaving Porto, the opportunity for an arguably superior Benfica to make up ground in season 2013-14 could be ripe, depending on who Porto sign to replace their stars. One of the things that counted in Porto’s favour this season was that by the time Benfica visited the Dragão for that key fixture, Benfica were still fighting on three fronts. Key players like Matic and Pèrez were playing twice a week consistently in the business end of these competitions, which is a risky strategy for the fatigue given their importance. That’s not to say the idea of a treble (or quadruple, briefly) wasn’t romantic to Benfiquistas. But the club has to prioritise. The Liga will always be the bread and butter of Benfica’s success – always. Domestic dominance doesn’t come from the Taça de Liga or the Taça de Portugal. These are two lovely trophies with history, but if Benfica are going to progress as a club, there are only two competitions worth considering – the Liga, and the Champions League. Consider for example, that the Eagles’ forage into the quarterfinals of the Champions League in 2011-12 earned them €20,7m, compared to €14.2m in 2010-11, when an exit in the Champions League group stage was followed by a subsequent semi-final appearance in the Europa League. As reference, Porto, who did not qualify for the Champions League that year due to a 3rd place finish in the Liga in 2009-10, earned a mere €7.9m from the Europa League in 2010-11 … and they won the competition! The Champions League isn’t just about prestige – it’s about finances, and while Benfica’s scouting and transfer business has produced some deals to rival those of Porto in recent years (Luiz, Ramires, Di Maria, Ceontrão, Javi Garcia, Witsel in particular), the club shouldn’t be relying on lucrative player sales to finance its squad changes (especially since player sales often implies the sale of key players that Benfica can’t really afford to lose, but often do). Benfica need to start prioritizing the Liga and the Champions League, and use the Taça de Liga and / or the Taça de Portugal as the competition where fringe or younger players are used to give them experience, or keep them match fit. That’s not to disrespect the domestic cups, but ultimately, they matter little to the vision of making Benfica strong on domestic and European shores, simply because the Liga and Champions League have a far wider audience and financial profile. Porto may have been less successful in reaching the latter stages of the Champions League or the Taça de Portugal, but they’ve ended the season having benefitted from playing 9 matches less. Considering that their squad was thinner than that of Benfica in certain positions, the fact that they’ve walked away with the Liga title is also a function of how they’ve prioritized and managed their squad over the season. And so ends the wishlist. There’s a simpler version for many Benfiquistas of course … do whatever it takes to win the Liga and beat Porto for once! And for some others, an even simpler version than that – change the manager…! And sadly, much of the above is not likely to happen unless Jorge Jesus’ challenges his own stubborn managerial ideals, or the Benfica structures do not support him with the signing of the players he really needs. But either way, assuming he stays, whatever changes are made by Jorge Jesus and/or Benfica for season 2013-14, one thing is for certain – after the near-success of season 2012-13, expectations will be high to translate Benfica’s recent underachievement into fortune and glory. This article also appeared on Outside of the Boot in June 2013.